General Motors Company sees a $15 billion profit opportunity in adjacent businesses, a group of three businesses that are auxiliary to GM’s core business that include GM Financial, OnStar and aftersales. “We continue to capitalize on these opportunities and see significant growth potential going forward, across all three [adjacent businesses]”, said GM CFO Chuck Stevens at the 2018 Deutsche Bank Global Auto Industry Conference. According to Stevens, GM’s aftersales business – which consolidates GM Performance Parts, Goodwrench and ACDelco – “continues to be a meaningful contributor to earnings”. 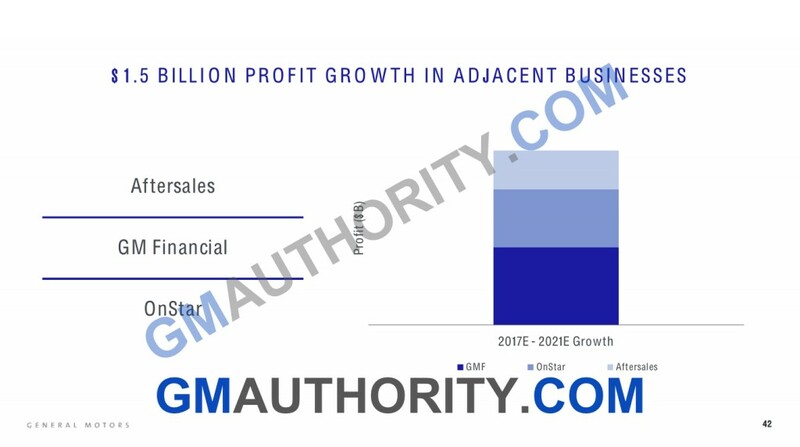 In fact, the executive explained that the division is a high margin business that, from a margin profile standpoint, is similar to GM’s pickup truck franchise, and revenue from the department is expected to continue growing into the future. The department was previously known as Service Parts Operations (SPO) before being renamed to Customer Care and Aftersales (CCA). The department is currently headed globally by Tim Turvey. Stevens stated that GM Financial (GMF) continues to grow as the automaker expands its portfolio and executes on its full captive strategy. GMF earnings are expected to double versus 2014 by early next decade. In the first quarter of 2018, the unit had $3.4 billion in revenue and earnings before taxes of $400 million. That compares to $2.7 billion in revenue and $200 million in profit for the first quarter of 2017. GM Financial is currently operated by Dan Berce, who has run the unit before GM acquired AmeriCredit and turned it into its captive finance arm. A few years ago, GM folded OnStar into its Global Connected Customer (GCC) department that’s part of the Global Customer Experience (GCX) department. Both departments were subsequently merged into the currently-named Global Connected Customer Experience (GCCX) that is run by Santiago Chamorro. “Taken together, aftersales, GM Financial, and OnStar, we believe we have a billion and a half dollar profit growth opportunity with these businesses over the next several years”, concluded Stevens. I like the 4-G connection and don’t mind paying the $10.00 monthly for that feature. But I see that other car manufactures are including a full ON-STAR like feature at no additional cost. I wish GM would follow suit. The five year limited is OK for five years but what happens after that? All On-STAR should be included even if it is in a package deal. GM finance for sure is a good profit center as long as they do not play the sub prime game. Now the On Star is low overhead and is like extended warranty and sold as a what if tactic. I could care less for it for myself but if it makes money I am all for it. Now the parts. Delco is doing well but they need to use care with divisions The divisions they sell off. The batteries were som3 of the best and now are trash. They tarnish the Delco name. As for the performance division, they could do better. Ford and Direct Connection are sold by a number of retailers and offer twice the product. You can go to Summit Racing and buy them. GM Oerformance you have to go to a dealer and generally order it unless it is on3 of their larger Performance retailers. If GM would open the door to a mass market retailer they both would make a lot more money. Note the biggest Ford Motorsports and Dirct Connection retailers are not dealers. Yet the dealers that want to sell these parts are not hurt and the smaller dealers that want nothing to do with them can opt out. I didn’t know that Goodwrench was still a thing. Do they mean Certified Service?